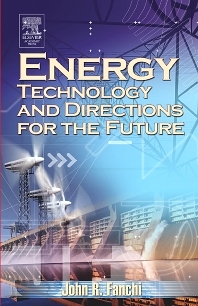 Energy Technology and Directions for the Future presents the fundamentals of energy for scientists and engineers. It is a survey of energy sources that will be available for use in the 21st century energy mix. The reader will learn about the history and science of several energy sources as well as the technology and social significance of energy. Themes in the book include thermodynamics, electricity distribution, geothermal energy, fossil fuels, solar energy, nuclear energy, alternate energy (wind, water, biomass), energy and society, energy and the environment, sustainable development, the hydrogen economy, and energy forecasting. The approach is designed to present an intellectually rich and interesting text that is also practical.This is accomplished by introducing basic concepts in the context of energy technologies and, where appropriate, in historical context. Scientific concepts are used to solve concrete engineering problems. The technical level of presentation presumes that readers have completed college level physics with calculus and mathematics through calculus of several variables. The selection of topics is designed to provide the reader with an introduction to the language, concepts and techniques used in all major energy components that are expected to contribute to the 21st century energy mix. Future energy professionals will need to understand the origin and interactions of these energy components to thrive in an energy industry that is evolving from an industry dominated by fossil fuels to an industry working with many energy sources. Presents the fundamentals of energy production for engineers, scientists, engineering professors, students, and anyone in the field who needs a technical discussion of energy topics. Provides engineers with a valuable expanded knowledge base using the U.S. National Academy of Sciences content standards. Examines the energy options for the twenty-first century as older energy sources quickly become depleted. The Twenty-First Century Energy Mix 15.1 Hydrogen and Fuel Cells 15.2 The Hydrogen Economy 15.3 Summary of Energy Options 15.4 Forecast Methodologies and Forecasts 15.5 What Does the Future Hold? John R. Fanchi is a Professor in the Department of Engineering and Energy Institute at Texas Christian University in Fort Worth, Texas. He holds the Ross B. Matthews Chair of Petroleum Engineering and teaches courses in energy and engineering. Before this appointment, he taught petroleum and energy engineering courses at the Colorado School of Mines and worked in the technology centers of four energy companies (Chevron, Marathon, Cities Service and Getty). He is a Distinguished Member of the Society of Petroleum Engineers and authored numerous books, including Integrated Reservoir Asset Management, Energy: Technology and Directions for the Future, Shared Earth Modeling, and Integrated Flow Modeling, all published with Elsevier.